There are millions of alpaca picture taken every week. These magical creatures steal the heart of everyone who comes into contact with them. However the great alpaca pictures come as always from those who have the eye to recognise the light , the situation and the composition as a potential upon which to lavish some time to get a great result. 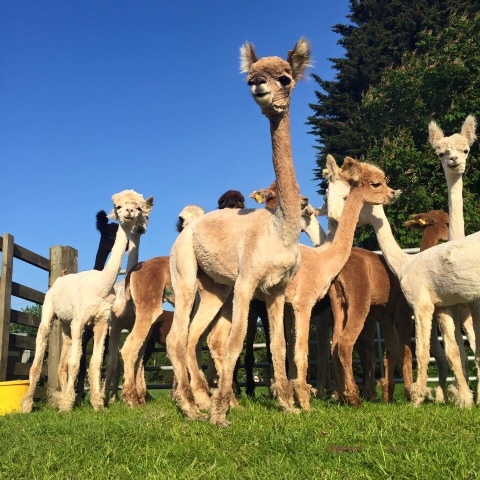 Whilst in the last throws of shearing on Thursday I noticed my daughter Kerry Lord sitting cross legged in the paddock with a bunch of newly shorn alpacas. She is currently 5 months pregnant with her second child and there she was shuffling slowly forward on her back side inch by inch until she was in a position to take this photograph. Was it worth it? Well judge for yourself. I see lots of alpaca photies having been breeding them for almost 20 years now., I have taken loads but just occasionally you see something that takes your breath away and this one took mine. Is it the combination of colours all bright and new in the air minutes after shearing? Is it the sense of release in the alpacas as they recognise summer after a wet winter? Is it the angle and the contrast against the deep blue sky behind? It's all of those and a lot more besides but more than anything it's the taker who knew what she wanted and pursued it with patient determination to achieve a fantastic result. Luck no way! It's called talent. My eldest has the 'eye' and long may she continue to use it to surprise us. Enjoy! Hallelujah....Bring on the boys ! Who's a smart boy then...?